For nearly half a century, Ball State University’s Miller College of Business has been providing industry leading business students across the world. Utilizing innovative technologies to provide flexibility and customization to students, Ball State aligns majors and course options with personal objectives. With nationally ranked faculty, students strengthen their strategic thinking, decision-making and executive communication skills through academic and immersive learning projects which harness advanced leadership skills and understanding of business trends at a cost effective price. Many of the program’s enrollees are also Ball State graduate assistants; perhaps it natu­rally follows that this “friendly,” “outgoing” bunch is always “willing to offer assistance and advice.” All in all, the student body here is very diverse, representing many coun­tries, ages, and backgrounds. “From the recently laid off exec trying to better himself, to the house wife that wants to have a one up on the competition when re-entering the work force,” all bases are covered. Although it is situated in the Midwest, “we seem to have a large amount of foreign students,” as well. While Muncie itself “is not a very nice city,” the school is “heavily involved in the local community.” Ball State has a strong reputation for maintaining high tech facilities espe­cially in media, education, and business departments. A recent total overhaul of facilities has only further benefitted the school: “the entire campus has been updated including new buildings, roads, landscapes, etc.” Everything is very student-friendly, “minus the parking.” “Free internet EVERYWHERE on campus, all sporting events are free, most speakers and events on campus are also free.” “I've had a VERY positive experience with BSU,” says one student. Long a pioneer in distance learning, the Miller College of Business at Ball State University in Muncie, Indiana offers an MBA program that is “broad and extensive, pro­viding several different paths to earning your degree.” The extraordinarily flexible (not to mention “very affordable”) school offers numerous delivery options that can accom­modate almost any student’s situation, including full-time, part-time, on-campus, dis­tance learning, and day or night classes (though classes are generally offered in the evenings), which “is very appealing to those who work full time or have to travel fre­quently.” “I didn't know where I would be living before starting the program, and did-n't want to start at a school only to have to not be able to attend anymore. Since most schools don't accept transfer MBA credit, I would have lost that time,” reasons a student. The greatest strengths of the school include “the professors and facilities”; professors have “extensive real world expertise” and “you can tell they LOVE what they do, which translates into excitement for the class, program and university.” These “very engaging” teachers even communicate this to distance learning students through Skype, email and whiteboard, using “their professional experience to help us learn.” “Everything is immersive,” and the course work is certainly challenging. “I have to work really hard to achieve good grades,” says one student. “Ball State provides immersive learning experi­ences to its students, [which] are difficult but necessary to understand the dynamic nature of the business world.”Uniquely, “there is a desire to get to know other distance learning students and collabo­rate in order to get more out of the taught materials.” “I feel as though I am a tradition­al student even though I am connecting via the internet,” says a student. The “cutting edge” technology and “access to the latest and greatest…software” truly makes for a “fantastic learning environment” that is “educating people of the future.” The ease with which students can sign up for classes and complete their degree “is amazing.” “Away with the old, go to Ball State, the way of the future universities!” says a student. 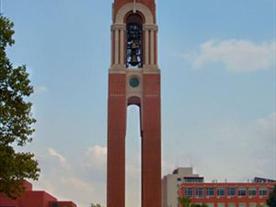 Want more info about Ball State University, Miller College of Business Distance MBA? Get free advice from education experts and Noodle community members.